Thinking of Croatia Island Hopping? Here’s our Perfect Day on the Water! If you’re heading to Croatia and you want to discover the famous Croatian islands, there are many ways to do this. 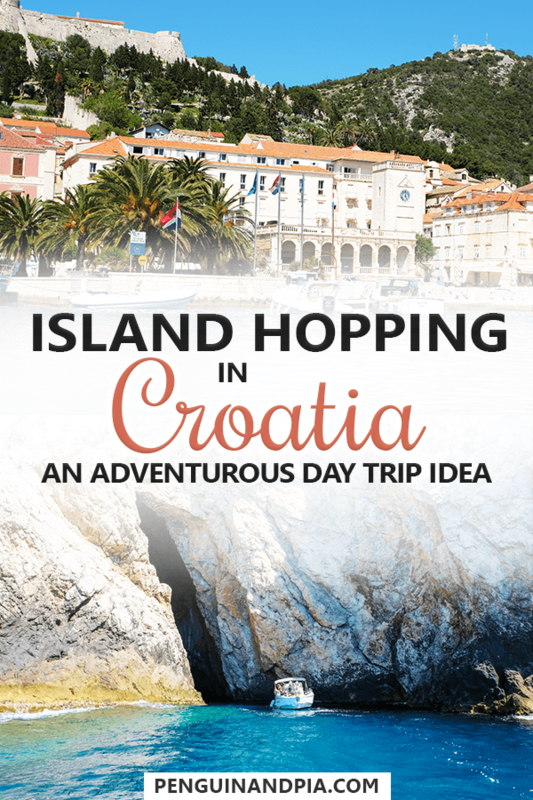 Unfortunately, the details for Croatia island hopping tips aren’t always the easiest to find. 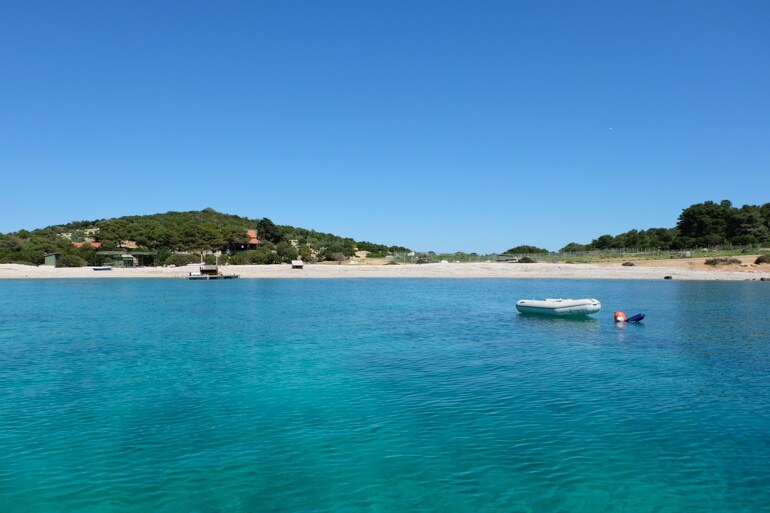 This makes planning the perfect itinerary for Croatia island hopping difficult to put together! Furthermore, it can be tough to island hop in Croatia on a budget since the islands require ferries or chartered boats to get between them. While there are Croatia island hopping packages, these can get expensive when they include overnight stays and other fees. Because of this, we decided to hop on a Croatia island hopping cruise. Given the time we had and for the price, we decided on a highly-ranked 5 Island Hopper Tour from Split with Providenca Charter & Travel to see 5 of the best islands in one long day on the water! 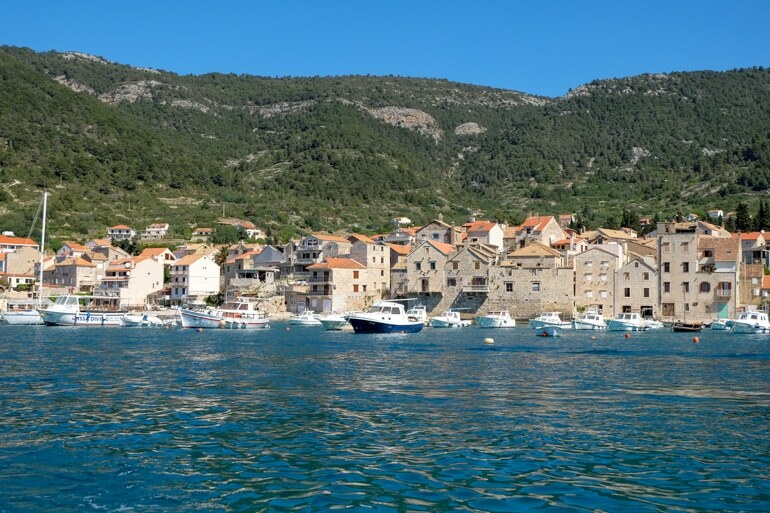 So, here’s our blog post on Croatia island hopping to Hvar, Biševo, Vis, Ravnik and Budikovac! Full Disclosure: This is NOT a sponsored post. While living outside of Split, Croatia for 5 weeks we wanted to see the islands but, like you, found it was kind of hard to figure out. We researched this tour, paid our own money, had an unreal day, and now we’re telling you about it. If you want to check out the video snippet from our once-in-a-lifetime experience, you can watch it below. Warning – it will make you crave sunshine, blue waters, old towns, and the sea air in your hair! In case you want to see the whole experience, you can watch it on our YouTube Channel here. The other boat on our two boat tour for the day. Towel and bathing suit. You could change on our boat if needed but this might not always be possible. Could just wear underneath. A change of underwear (if you do swim) – sitting in wet clothes makes you extra cold on the boat. Wear clothes that can get wet/easy to put on or take off. Money for tipping/lunch/coffee at cafe/souvenirs. The skipper will provide you with jackets and bottled water but if you want your own coat or sweater then bring one. You ride for a while and the wind can get pretty chilly even if you’re in the sunshine. We met the boats in Split but they do offer to pick you up from Trogir. The times differ depending on the season but Providenca will email you after you book to confirm. The boat we took was like the one in the photo above but a little larger with more of a cabin that you could sit inside as well as at the back in the open air. Our guide was Spiro and he was a great guide – quite funny, a very skilled boat driver, and he genuinely cared about all of our needs the entire day! 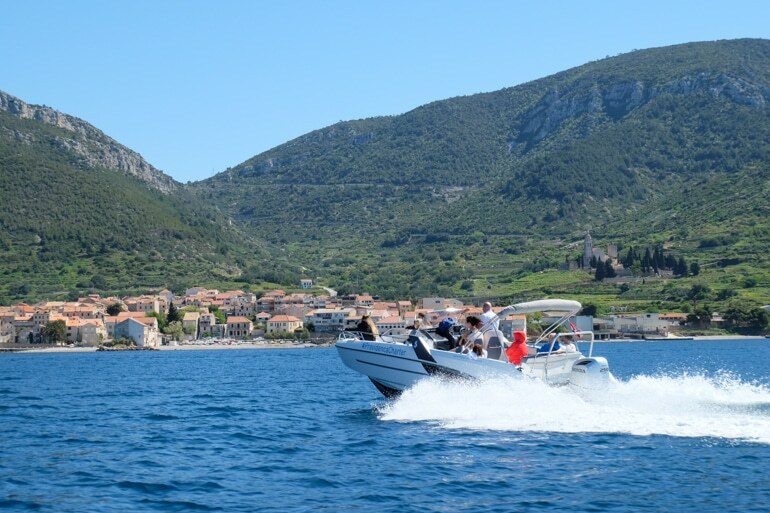 The group was divided into two boats and at 8 am sharp we started heading into the open blue sea from Split! The first ride is actually pretty long – about an hour and 45 minutes to get to the Blue Cave. The islands are quite far out but close together so once you get out there it’s easy hopping for the day. On the way we got stopped by the police because they check boat papers (this is totally normal) and we even saw dolphins! It was super exciting to see them swimming along and cresting the water near the boat. The ride can be cold in the morning before the sun is super hot so Spiro will give you jackets to wear to keep warm. He also provided us with an information booklet to read about the island of Vis before we got there. It can get quite rough on the open sea but it’s still comfortable. The skipper explained everything and was super aware of the sea conditions so he sped up/slowed down accordingly. Planning a Road Trip? – Customizable Croatia Road Trips Already Planned for 5-14 Days Long! 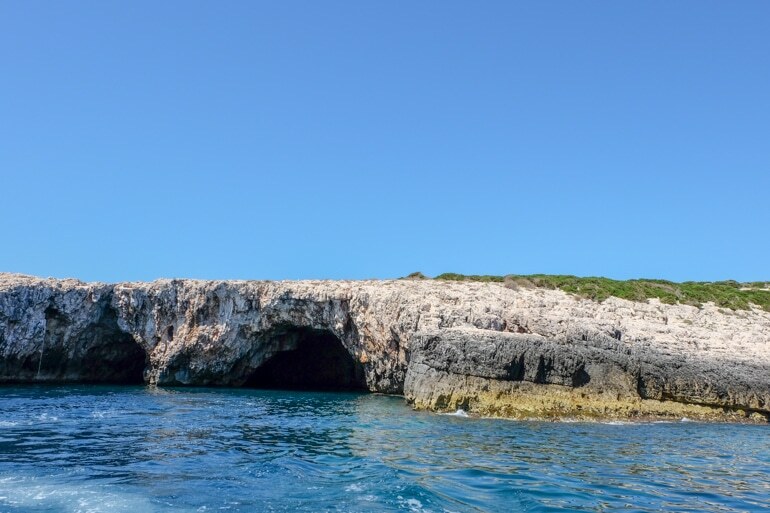 The first stop was Biševo Island to see the famous Blue Cave. You have to go with the local guides because they have special boats for the entrance size to the cave. If it’s too wavy (because of the wind) the entrance is literally closed off by the water so Providenca will find a suitable alternative for you to visit. The skipper will buy your tickets for the Blue Cave. You’ve already paid for these by booking the Island Tour so you just wait there and snap a few photos. Then you hop in a new, smaller boat and go! We’re not going to show you photos of the Blue Cave – you’ll have to watch the video and you’ll see exactly what it looks like inside! 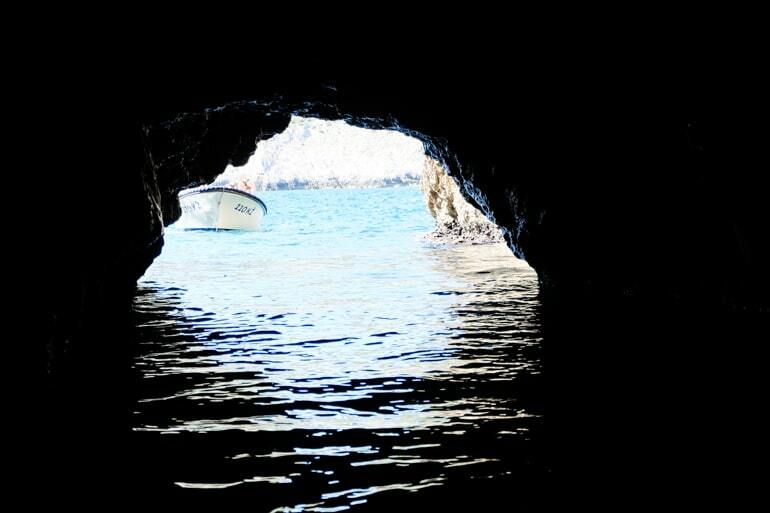 Inside the Blue Cave, looking out the only entrance… be sure to duck! The cave is, as imagined, very blue. The new guide explained everything. They have to turn off the motors and use a stick to navigate inside the cave. It’s cool to see – smaller than we thought it might be but very pretty. You don’t get a ton of time so snap your photos quickly when you get a chance. While it’s worth seeing as part of this tour if you wanted to go ALL the way there for just the cave, don’t. An almost two-hour drive wouldn’t be worth it just to spend 10-15 minutes inside the cave. Be sure to see other stuff in the area as well (like Komiža). We discuss this further in our top things to do in Croatia post. We then drove from the Blue Cave to Komiža on the island of Vis. It wasn’t a long drive. We did stop at one cave in between. Both boats actually went inside the cave at the same time and had room to turn around. The best part about the cave? There were tiny pink jellyfish floating around the blue water. They were actually adorable just kind of bobbing in the water. They do sting, though, so be careful if you swim later on in the tour! The second cave itself was actually one of the tallest seaside caves in all of Europe. The high ceiling wasn’t that cool when we were inside. When we left the cave and saw the other boat on the water, it was THEN that you could see how tall the ceiling actually was and we were honestly amazed. It was huge! But the darkness made it seem so short. Very cool. Explore This Classic Croatian City – Check Out Things to Do in Dubrovnik! Komiža, the cozy fishing village. 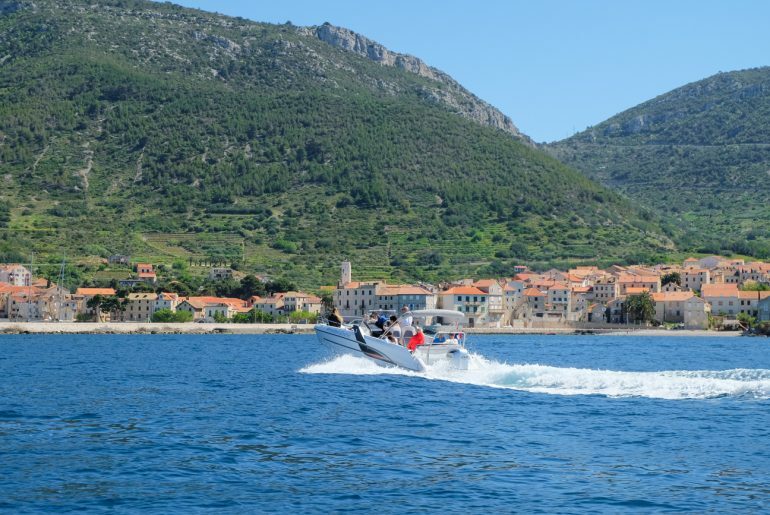 Komiža is a small village where the locals are proud of their fishermen’s history. Spiro even told us about the military history on the island. We had one hour to explore and Spiro was sure to get everyone on the same page with the times before sending us off to explore. We walked through the whole old town to a beach where the divers are based. We had lunch on the beach basically to ourselves and snapped photos. We returned to the main harbour area and grabbed a coffee before getting back on the boat. Be sure to bring your camera since Komiža is lovely! We then drove to Stiniva Cova in the island of Vis. The ride wasn’t too long but we did stop a few times to check out some seaside caves and learn a bit about the local area. There are quite a few little holes/caves, tall cliffs, and the tunnels on the side of the coast that were once used in World War II times. The next stop was checking out Stiniva Cova on Vis. You can get off and enjoy the beach and/or snorkel if you’re interested. For us, it was the off-season so we didn’t get off the boat and opted to swim later in the day. Spiro was fine with the guests’ decisions. There were also lots of jellyfish that you’d need to avoid. It’s considered one of the 10 most beautiful beaches in Europe but honestly all it is rocks/coral and not sand so we’re not sure how comfy it is! 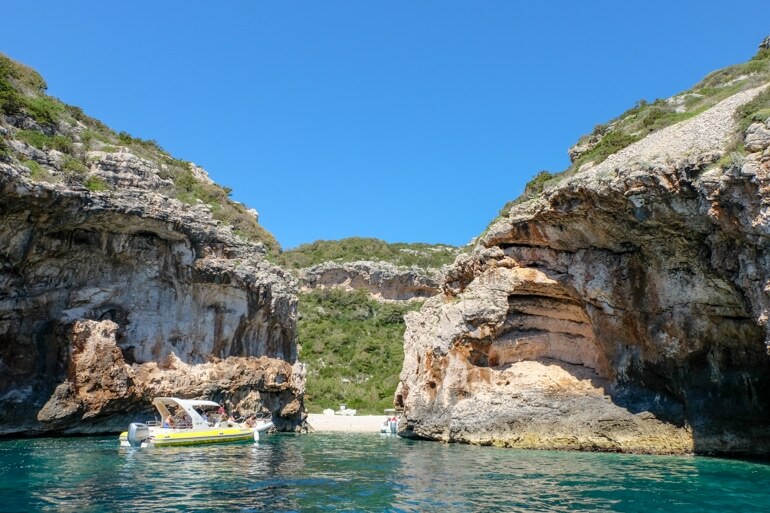 Stiniva Cove, uncrowded and beautiful. The tour boats went in behind the cliffs so we could see the beach. There’s a little restaurant there as well but it wasn’t yet open for the season. The beach and the cove is apparently crazy busy in the high season with cliff jumpers and boats anchored. You can’t take your boat into the beach area during that time so were lucky to have visited in April (but, of course, you can swim to the beach in the summer). You can also walk to the beach by land through underground tunnels and down steps if you’re on Vis. We obviously didn’t do that route, though! The Green Cave from the outside! Spiro then drove us to the Blue Lagoon on Budikovac Island. On the way, we stopped at the Green Cave which was very cool. It was beautiful to see. There is a hole in the cave ceiling so the sun shines through as a condensed beam of light into the water. The light hits the bottom of the cave and the light reflects up and dances in the cave walls. There are two entrances to the cave which can be confusing once you’re in there. That said, we went in because it was low season and there were only two other boats but apparently this might be different during the high season. If you have any questions about the tour, be sure to fire them an email before or after you book. They were very responsive to us! The Blue Lagoon was probably our favourite spots on the whole tour. The beach was made of tiny pebbles that were (almost) like sand. The whole area was super beautiful. There’s a guy that owns the island and he has a restaurant open in the summer. He also has donkeys, sheep, and chickens on the island. Apparently, he’s been asked by real estate/celebs to sell the island for A LOT of money but he refuses because he would rather it be enjoyed and not made private. Good for him! The Blue Lagoon is … very blue. This was the point in the tour where we got to swim. Totally worth it! It was a little cold but once you were in for a bit it was really nice. There were way less jellyfish there and we got some great GoPro footage underwater. Our skipper pulled up to a private dock where we could lay in the sun after the swim. We had 45 minutes total to swim and chill but in the summer you’ll likely have more time. Spiro offered the snorkel gear which was ready to go in the boat but we all just swam. In fact, our whole boat swam and that’s when we really got to know the other people on our boat. It was a mix of couples and friends – just lots of nice people to spend the day with. It’s also advised to get changed out of wet bathing suits before heading to Hvar because the ride can be a little chilly in wet clothing! From the lagoon, we headed for the famous island of Hvar. The trip there was longer but not crazy long – probably around 35 minutes which was longer compared to the previous shorter transitions between islands/caves. The ocean wasn’t too rough though once you get in between some of the smaller the islands. In all, we had two hours on Hvar. Reviews of the tour on Get Your Guide feel like two hours isn’t enough! Skipper Spiro told us about a restaurant where you get 15% off if you go because you’re on the tor. We declined to go to take photos instead and got a smaller snack later. We then hiked up to the fortress (Fortica) but we didn’t go inside. We went up there for the views and they did not disappoint! We then walked through the old town and along the harbour. Being a duo looking to explore, we ducked into a side alley and found a great pastry/bakery place Nonica and had great dessert and waters. It was SO good – and the seating outside in the beautiful quiet alleyway was nice for getting out of the sun. It might be different in the high season in Hvar, though. 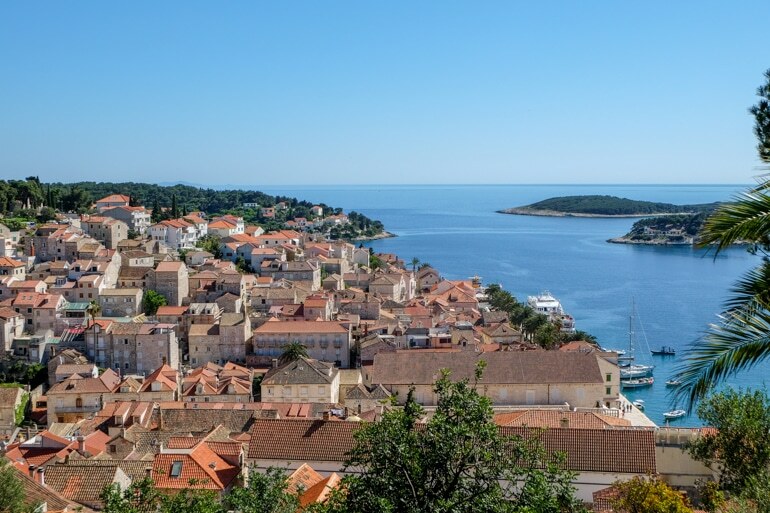 If you want to find MORE things to do in Hvar – we wrote a whole post just on Hvar! Hvar from above hiking to the Fortress. We all got back on the boat and Spiro told us we had to get some fuel before headed home to Split. Refueling was quick and the trip to Split from Hvar was about an hour (more or less). The setting sun made it a tad cooler but still pretty warm. We had also been in the sun all day so we were radiating heat making us a little extra cold compared to the morning. Lisa needed Eric’s sweater but those jackets on the boat came in handy for many! Once we got back, both boats got together for a group photo, we shook Spiro’s hand, and off we went to catch the bus home! And there you have it, our awesome day island hopping in Croatia. Would we do it again? Absolutely. Honestly, it was worth the money for the convenience and the experience. Here’s the thing: you wouldn’t be able to do all of that on your own without excessive local knowledge and/or the right planning. Doing a tour of some islands from Hvar would be fine but you’d then only see 2 or 3 things out of the 5. 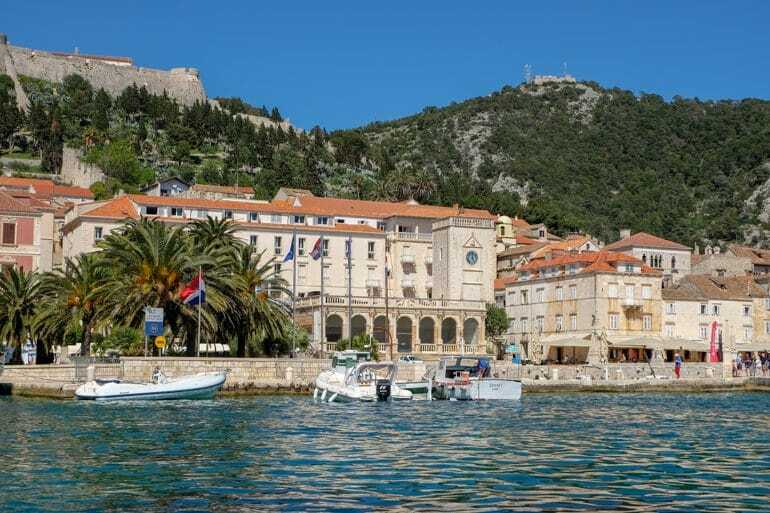 Furthermore, the ferry times in the off-season from Split to Hvar are not as frequent so to do Hvar we would have had to stay a night which wasn’t convenient for our timelines and budget while staying in Split. So for all those reasons, our tour was beyond great! Doing this tour was an excellent “zero-hassle” way to see all 5 locations and it was a safe, fun, and enjoyable the whole time. If you want to learn more, you can check out the Island Hopping Tour here. 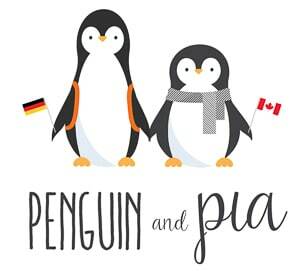 If you go – let us know what you think!